Caversham, United Kingdom, GBR ASM1X Andy HOUGHTON. Photo by Peter Spurrier. You’d only do this if you’re in love. Here’s the scene: the sun hasn’t yet risen. It’s still chilly outside. The water that splashes over the gunwales of your boat every once in a while is cold, the kind of cold that doesn’t stop at your jacket, the kind of cold that seeks out your bones. But here you are, hands on your oars, the clip of the rowing motion creating that crisp sound when the blades release from the water. If you’re reading this article, you can feel it. It’s the reason you get out of bed before everyone else. 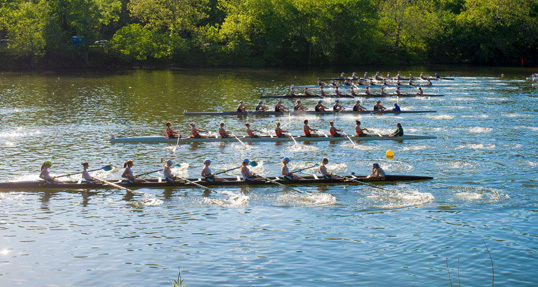 It’s why you drive hundreds of miles with a skinny rowing shell on top of your car, dodging other rowers as you pull into the regatta parking lot, the call of the starting line too much to resist. You’re in love. What is it about this crazy sport that draws us so deeply into the depths of this love affair? Likely, you’ve got a ready-response for the friends and family members who think you’re crazy for being a rower. “What’s so great about rowing that you’re willing to give up so much for it?” This is a question every rower who has fallen in love with the sport has been asked, and answered. Here’s the thing about love, though: love grows deeper—and gets stronger—when it creates something that is bigger than the sum of its parts. When you hop into a boat, the potential for becoming part of something that is bigger and stronger and faster than your singular abilities is the essence of the sport. In big boats, sure, this is obvious. It’s that feeling that happens when all of the rowers are driving and swinging and releasing the blades together—a choreography that eclipses the individual effort of any one rower. But what about in small boats? Of course, it happens there, too. Scullers in small boats generate that same feeling, even as a lone rower in a single. It’s that feeling of run, that moment when your blades release from the water and your boat accelerates, even though you’re on the recovery now, handles floating back to the catch and not an ounce of effort applied. Run. Technically speaking, boat run can be described as an increase in velocity after the application of power is complete and the blades have exited the water. This feeling is what most rowers know happens only after they execute the rowing stroke well and let the magic of the hull come into play. The boat “runs” ahead of itself, gaining speed even after the stroke is over. Para-rowers who row on a fixed seat, however, find it extremely difficult—if not impossible—to experience run. This isn’t due to skill or fitness or technical ability; it is simply too difficult to overcome the inertia of the wider, shorter, and heavier hull that is required in FISA competitions. This would likely be true for able-bodied rowers who hopped into a para-rowing shell and got strapped into the fixed seats that para-rowers use for stability in singles and doubles. No boat run. In para-rowing, if your motion is restricted by an injury or medical condition that limits the use of your legs and torso, you’ll likely be classified as a “PR1” rower and you can row in a single or double shell with a fixed seat. The seat is bigger, it gets bolted to the seat tracks, and has a backstay to stabilize your torso. You’ll be strapped to the seat around your torso and across the top of your quads. If you have the use of your torso, but not your legs, you’ll likely row as a “PR2” rower, again using a fixed seat, but here only your legs will be strapped to the seat deck, allowing you to use your torso for the swing portion of the stroke (most PR2 rowers don’t use the backstay PR1 rowers use). In 2017, FISA, the international governing body of rowing, approved a rule change that extended the length of the race course for para-rowers from 1,000 to 2,000 meters, giving para-rowing the same race course length as able-bodied rowers. This was a change that was welcomed by the para-rowing community, as it brought a level of equity to the sport and legitimized it in a way that only equity can. On the racecourse, though, para-rowers who don’t use a leg drive (PR1 and PR2 rowers) are limited to rowing boats that are 10 kilograms heavier than a conventional racing shell. Read that again. The racing single and double shells that para-rowers use are, by FISA rule, 10 kilograms, or 22 pounds, heavier than what able-bodied rowers are allowed to race in. Originally, the weight differential was intended to provide a more stable hull, ensuring safety for the rowers that require straps to hold them to the fixed seat in their boat. The straps are regulated and required to have quick-release mechanisms, should a boat capsize with a rower in it, and the hulls have pontoons affixed underneath the riggers to provide the boat with added stability. Para-rowing is a growing sport. With every bit of growth comes innovation. Recently, several boat manufacturers have developed hulls that can withstand the added pressure of a seat mounted to the seat deck, have pontoons attached to special riggers, and yet still use a conventional hull design. The results for para-rowers are not surprising: they see faster times on the water and are still assured of their three points of contact with the water (the hull plus two pontoons). The difference—for the first time for many PR1 and PR2 rowers—is what happens after they finish the stroke. They feel run. Boat run. The magic happens. Isaac French grew up without his lower extremities. Born with a limb difference in his legs that required amputation, French has been a double amputee since the age of three. Following in the footsteps of his older brother, French now rows for Saratoga Rowing Association, just outside of Saratoga Springs, N.Y., and is the first adaptive rower in his club (adaptive rowing is the term for all rowers who adapt the equipment to meet their mobility needs; many rowers who begin as adaptive rowers go on to compete as para-rowers). “I started in a Vespoli single,” French, who is home-schooled, tells me in an interview between classes. “My dad made me a special seat and we put pontoons on the riggers with brackets from the hardware store. It was a DIY adaptive boat.” French quickly took to the sport and began training to compete. French is classified as a PR2 rower, since he has the use of his torso. “I train in the FISA-approved boats because we have to race in them.” Not surprisingly, French, like most athletes, explains that he finds it simpler to train in the boat he races. But as an experiment last fall, he hopped into a conventional single shell that had been outfitted for adaptive rowers with a reinforced seat deck to accommodate the added pressure of a fixed seat and pontoons on special riggers to give the boat added stability. “It’s really like a different world,” French says. Ellen Minzner, the coach of U.S. national team PR3 coxed four that has won silver at the Paralympics and world championship level for the past four years, is on the FISA Para Working Group. I ask her about the questions regarding boat weight that have emerged since the length of the course was changed to 2,000 meters. “Some people thought going to 2,000 meters would be too much for the arms-and-shoulders [PR1] athletes. My feeling is that it won’t be, if you deregulate the hull.” Minzner is also the director of outreach at Community Rowing, Inc. in Boston, a position she uses to draw rowers to the sport. “At CRI, we believe everyone should row in hulls that are at the level of their experience.” Minzner and her team of coaches at CRI encourage all rowers—para-rowers and able-bodied rowers alike—to row in the boat that matches their ability. For corporate training sessions, CRI coaches even sometimes put pontoons on an eight to ensure the participants of their corporate programs are safe and experience rowing positively the first time they are on the water. “I’m not saying the top racing shell is for everyone.” Minzner turns our interview toward her experience with having para-rowers in conventional shells outfitted with pontoons. “We started putting our athletes in racing shells. Misha [Joukowsky] and Resolute forced the issue. They brought a Resolute shell over [outfitted with pontoons] and I got into it myself. I couldn’t flip it. We put athletes in it. Everyone was seeing numbers they’d never seen before. Ten seconds off a 500-meter split.” Minzner pauses here, as only a rower would, completely understanding the significance of shaving 10 seconds off a 500-meter split time. Minzner isn’t one to turn away from what the real issue is. “If the boat weight for para-rowers remains 10 kilos heavier than other boats, no pontoon or seat innovation is going to overcome that. A lighter hull will bring the innovations to maintain safety and that’s what will drive innovation for para-rowing.” Minzner predicts that the boat-weight regulation will change at some point. The question is when. FISA rules stipulate that changes to para-rowing boat specifications can only come in the year after the Paralympics, so the earliest year that could usher in a change is 2021. Conny Draper is an applied sports biomechanist who has consulted with myriad national teams around the world, helping them test and identify the biomechanics systems at play in their equipment and rowing technique. She is a member of the FISA Technology and Equipment Commission and also works closely with the Para Rowing Commission. I caught up with Draper as she was between flights, traveling between three countries in 48 hours to consult with several teams and clubs. Draper knows that data will lead the discussion. “The data we currently have showed what everyone expected: you’ll be able to hold top boat velocity longer through the beginning of the recovery phase, allowing para-rowers to hold speed more easily.” Draper also showed in the comparison study the range of boat roll a para-rower experiences in a FISA-approved para hull versus what an able-bodied rower experiences in an Olympic hull. The difference is not surprising. In both hulls, at the elite level, para-rowers experience an average range of 9 degrees of roll (+/- 3-degrees) while an able-bodied elite rower experiences 2- to 3-degrees of roll (+/- 1-degree).